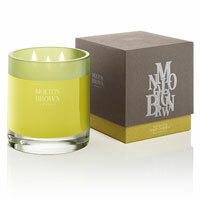 Molton Brown candles, scents and fragrance list. Molton Brown home fragrances: Founded by Caroline and Harvey Collis in 1971 in the UK. One of London's bath, body, and beauty connoisseurs since 1973. Exotic blends of bold fragrances with bright colors for their perfumes, candles, body lotions, shower gels, and hand care products.